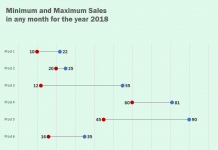 Excel charting is in the air for last few weeks and we are learning some really cool tricks on making charts better looking and also fulfilling the purpose. Today we will learn how to make Excel charts with background that changes with the change in certain condition. So it is really cool. So lets do it! Step 1: Open the tutorial workbook you just downloaded. Step 3: Go to cell C1 and make a heading Green and in cell D1 Yellow. =IF($B$14<0,9000,NA()). Double click the fill handle to populate the cells with the same formula. This will help us in getting the background conditionally colored depending on the data. Step 4: Select the range in columns A to D. Go to Insert tab > Line chart > Line with markers. This will insert the chart. Step 5: Having the chart active go to Design > Add chart element drop down button > Trendline > linear. A dialogue box will appear to ask for what series you require trend line. Select sales and click OK. Step 6: Remove the unwanted chart items like labels and lines by selecting them and hitting delete button. Step 7: Right click on the green line appearing at the top and from the menu select change series chart type. Step 8: For green and yellow select stacked column chart type. Step 10: To change the color of background to your liking, having the chart active go to format tab > current selection group > select green series from the drop down menu and change the fill color. Same way, select the yellow series and change the fill color you like. 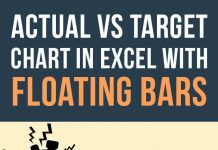 Amazing Excel tips. Thank for sharing this, these skills are going to help me alot in my new job.